The Keswick Christian Crusaders hosted the Canterbury Crusaders in a thrilling 2A-5 playoff match up. Keswick built a big lead only to see it vanish as Canterbury came storming back to tie the game and send it to extra innings. 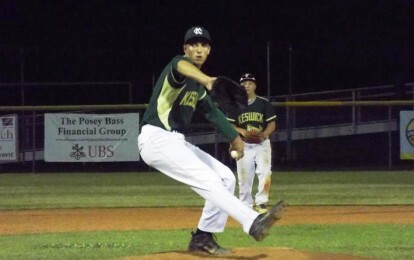 In the bottom of the ninth, an error on Canterbury allowed Zack Petchonka to score the winning run, giving Keswick the 8-7 district playoff victory. The teams were tied into bottom of the ninth, when Petchonka sent a 1-0 pitch into left field for a single to reach base. A few batters later, with two men on, Christian Horner reached on a fielder’s choice. But an error on Canterbury allowed Petchonka to round third and head home for the winning run, advancing Keswick in the district playoffs. Keswick (19-4) got going early with a Tanner Suarez sacrifice fly that scored Josh Paulton. Will Killpatrick increased the lead to two when he crossed the plate on a balk. In the third, Keswick tacked on three more runs. First, Seth Sorrell crossed the plate on a passed ball. Then, a Josh Guerin single to center field scored Nathan Leuthold to increase the lead to four. Canterbury (9-15) found themselves down 6-2 entering the sixth, after Jackson Parker and Bobby Ballew scored in back-to-back innings to pull to within four. After reaching on an error, Hunter Chance scored the first run of the inning to spark the rally. Another error on Keswick, allowing Bredon Smith to reach base, opened the door for Jacob Wilson and Antonio Ramos to cross the plate to cut the deficit to one. Parker extended the rally in the inning when he reached on an error by the infield, allowing Ballew to score his second run of the game and then Smith scored the go-ahead run from second on the same error, giving Canterbury the 7-6 lead. Keswick, now facing a deficit heading into the seventh, saw Guerin reach base on a single past the infield with one out. Guerin came around to score the tying run late in the inning with two outs to send the game to extras.